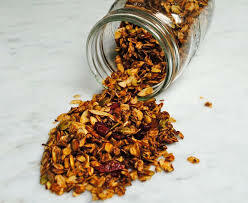 This granola is simple to make, lower in sugar than commercial varieties and contains no artificial anything. I spoon it over yogurt for a healthy snack anytime of day. 8 C rolled oats, 1 1/2 C wheat germ, 1 1/2 C oat bran, 1 C sunflower seeds, 2 C chopped pecans, 1 tsp salt, 1/2 C brown sugar *, 1/4 C maple syrup, 1/4 C honey, 1 C vegetable oil, 1 tablespoon each cinnamon, and vanilla, 2 C raisins/cranberries, 1 C coconut. Combine dry elements in a big bowls. Stir together brown sugar, honey, oil, cinnamon and vanilla in a saucepan and bring to a boil. Spread out over foil lined cookie sheets and bake in a pre-heated 325 degree oven for 20 minutes, stirring half way. * Organic, coconut palm sugar may be substituted. Many thanks to Frank who runs Casa Santiago, a great Bed and Breakfast in Merida in the Yucatan, for sharing this recipe.